I am looking for a book cover FRONT and BACK. This book will be 8 x 10 and it is a coloring book for adults that are hilarious puns! I have attached two images and you are welcome to use either one, I only want one on the cover, but it might be easier to have a variety. Please color the pictures accordingly, one of them is an oven talking to a pizza and the other one is a wine opener talking to wine corks. Colors should match the content. Please DO NOT include author name on the cover. 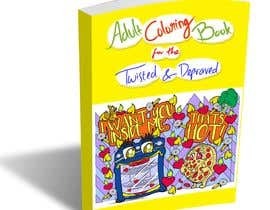 The title is: Adult Coloring Book for the Twisted and Depraved.